Special No, YOU Tell It! “No Regrets” Show at FDU | No, YOU Tell It! Our own Kelly Jean Fitzsimmons was stoked to spend the week at Fairleigh Dickinson University working with the incredible students in *FDU’s low-residency MFA program in Creative Writing on how to read their fiction, nonfiction, or poetry with a little oomph (as we like to call it). She also produced a special No, YOU Tell It! show with a trio of alums from the program. After an intense 10-day writing residency at the Florham campus in Madison, NJ packed with workshops, lectures, visiting authors, and a killer outdoor dance party – No, YOU Tell It! “No Regrets” (theme intentional) had the formidable time slot of 10 am on the final Sunday morning. But switched-up storytelling knows no bounds as the crazy talented Heather Lang, Letisia Cruz, and Taz Ruffilo (pictured left to right in the top row) wrote and performed three amazing pieces, keeping everyone captivated down to the residency’s last moments. 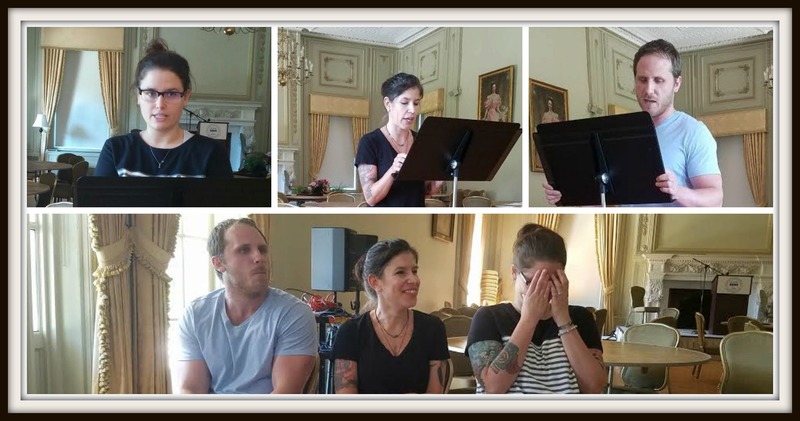 Over the past month, the trio participated in intensive story workshops and rehearsals with Kelly Jean, and the final result both broke and warmed our hearts. A huge thank you to René Steinke and all of the brilliant faculty, students, and alums at FDU’s summer residency, especially our “surprise guests” at the show Renee Ashley and Patrick Joshua Laskey! Want to bring a No, YOU Tell It! workshop to your school, organization, or office? Click here to learn more or contact us at noyoutellit@gmail.com. *FDU’s low-residency MFA program in Creative Writing is ideal for students who want a more flexible academic schedule. Students attend two 10-day residencies each year, one in August at FDU‘s Florham campus in Madison, New Jersey, and one in January at the university’s Wroxton campus in Oxfordshire, England. Throughout the remainder of the school year, as they write and revise their creative work, students work one-on-one with their mentors and participate in online workshops. Click here to learn more about the program and how to apply.